This page provides you with Dentist resume samples that you can use for inspiration in writing your own resume, or for creating one through our easy-to-use resume builder. Below you'll find our how-to section that will guide you through each section of a Dentist resume. First of all, dentists should be appreciated more! Ok, I am sorry, you are here to get a standout dentist resume sample and definitely not to get a reminder about how many of us are scared when we have to schedule an appointment with you, but I couldn’t help myself. Thank you so much for your hard work, yours is one of the most underestimated professions ever. Let us return the favor and help you with the best resume sample a dentist could dream of! As you know, this is a highly competitive market and you have made the right choice in looking for some professional help to craft your dental resume: it can be faster that you might believe, especially given the extensive experience we have had with many of your peers in the past. Sit down and relax, we are going to walk you through the perfect resume, step by step: let us inspire you and get that dentist position you have been dreaming for a while now! How to Write a Dentist Resume? Let’s start with the layout: you want a nice and simple one that is easy to understand and that will allow the recruiter to find the important pieces of information with ease. The reverse-chronological layout is what you want to go for: it does show your most recent work at the top, highlighting the best wins of your last few years! Consider the type of language being used. A neutral or friendly tone is needed as it shows a nice light hearted side and employers will take you seriously. Oh, and save your dental resume in the PDF format. Microsoft Word files look different on different computers, don’t risk that! You’re all good to go, let’s move to the next section of your best resume ever! It’s easy to say you don’t need a summary and yet it can be a highly useful element of your resume: this is your chance to let the employer know who you are and what you can bring to the table, in less than 60 seconds! That’s exciting, so please take your time, sit down and work on this section carefully. Employers look at summaries more so than actual resumes so it may be worth having. Always highlight the talents that best suit you to the job. Keep your skills at the forefront of the summary. Your qualifications should be noted. Try to joke around in the summary. Employers will take a very close look at the type of person they are hiring and often want to ensure they meet a certain level of standards. For some businesses, they require someone who has a certain number of years of experience and they have to relate to your work history to find out about that. When you are tackling this part, you have to ensure you’re clear about your history. Honesty truly is crucial because employers hire by what they see and if you tell them you have a vast array of experience in one area and they hire you but you can’t do the job, it’s a waste. That’s why you should talk about recent history in fields relevant to dentistry and what other dental surgeries you’ve worked at also. Show why you’re a good candidate. Talk about your recent skills. Have experience in dentistry listed. Use reference information which is out of date. Have references which don’t exist. Stuff your resume with incorrect information. For more tips on writing the best work experience section for a great dentist like you, check out our detailed resume guide. Recruiters like to see educational sections in a resume. Any recruiter looking to hire will want to know about you as a person but also your abilities as a member of their team. Having no education background on the resume is cause for the recruiter to get suspicious and it might lead you to getting no callback. Instead, you have to add even the basics and it will help. When you received your school education. How long you remained in education and what you studied. Which degrees or qualifications you own. Dentists don’t stop learning after their university days are over and you may have continued to learn new things such as orthodontic braces. Any additional dental education you have could be added to help improve your educational area. Remember, employers will employ new tactics to sort the wheat from the chaff and you have to ensure you make the wheat pile! What you have to do is to look at the skills you’re putting onto your resume and ensure they are the ones which the employer’s are looking for. If you don’t put the relevant skills on your resume, you can get put to the back of the pile. We can help you to decide which skills are best suited and which aren’t. Are you sure your dental skills are listed in full? You absolutely have to ensure your dental skills standout and that means carefully going over every soft and hard skill you list. Always try to bring your best skills to the front as they are the ones employers are interested in. It’s a smart move to use a cover letter with your resume. Follow our tips here. Use an email address for business use. Use links to professional profiles online and not social media. Ensure the hobbies you list are relevant to the job. Don’t use an email address which is shared with others. Have a page full of responsibilities or work history alone. Use more than one font or color on your resume. Well, we are done! 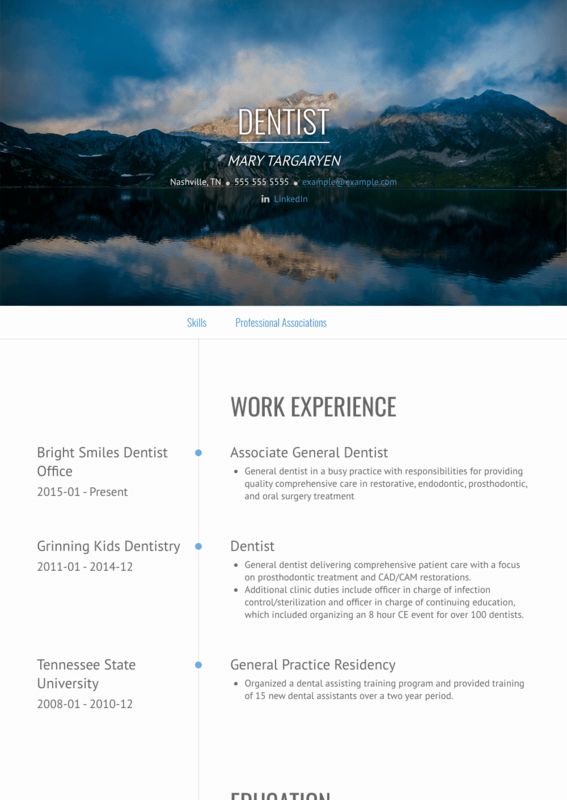 You now have access to a standout dentist resume sample: if you are also looking for the best dentist resume templates, you should check this masterpiece we have been working on here : many professionals like you have successfully used it to take their career to the next level.